This section allows you to set retention time (in days) after which a job will be removed from the list. 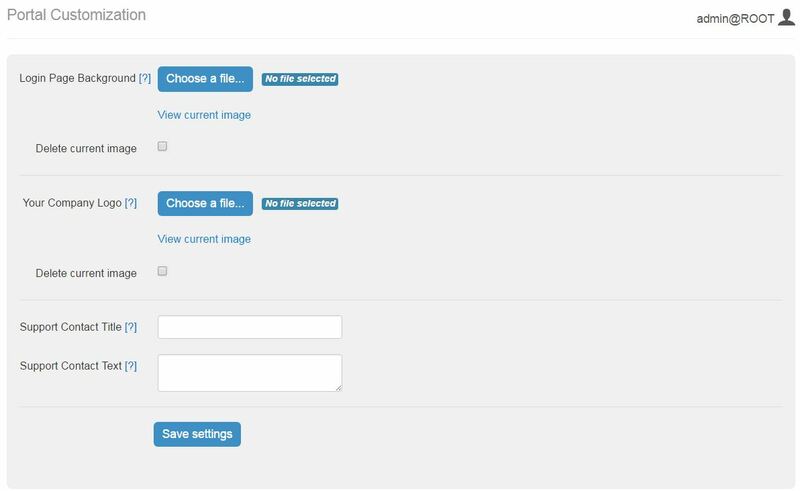 These settings allows you to customize you AIMMS PRO Portal where you can upload Image for Login page and your Company logo. You can also specify in-house support contact details which will be displayed on all Portal Pages. (see below). You need to specify following fields. Login Page Background - Background Image for the left-hand side of the login screen (JPEG, PNG or GIF). Image width should be between 640 and 2500 and image height should be between 800 and 2500. Your Company Logo - Logo for all portal pages except login page (JPEG, PNG or GIF). Image width should be between 10 and 120 and image height should be between 10 and 80. You can view this image by “view current image” link and can delete current image by selecting “Delete current image” check box. Support Contact Title - The title for the support contact block (plain text). Support Contact Text - The text for the support contact block. This can contain any HTML. The button Save Settings validates and save the settings. You must restart the services in order to see these changes on Portal.